considered the world’s preeminent superfruit. 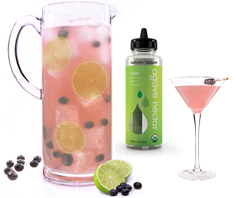 Grab a pitcher, a few friends and experience the delicious Re-VeeV-er, featuring Nature’s Agave and VeeV Açaí Spirit. A featured cocktail at the 2011 Aspen Food & Wine Festival. Fill the pitcher ¾ full with ice. Add all other ingredients and stir well. Top with fresh blueberries for garnish.